As you guys should know already, Shotwell is now the default photo manager for Ubuntu 10.10 instead of F-Spot. Yorba has released Shotwell 0.7.2 with a number of bug fixes and improvements. The latest update is available via ppa for Ubuntu Lucid and Maverick. Major startup problem when the user's Pictures directory is actually a symbolic link is now fixed. Fixed potential crasher when the user's Pictures directory contains a large number of subdirectories. Fixed update problem when using an external editor on a photo that was edited externally in an earlier session. Yorba has also released an update to gexiv2 0.2.1 library which is a requirement for Shotwell. This update fixes a bug where a photo file with malformed EXIF could cause a crash. 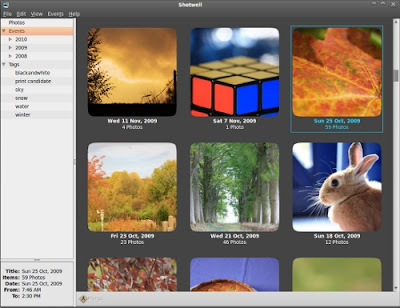 Latest Shotwell 0.7.2 is available in Yorba PPA. Now if you haven't installed Shotwell, do the following after installing Yorba PPA.